Ethiopian Coffee is among the worlds most unusual, offering a range of flavors from winey to fruity. Ethiopian Yirgacheffe is soft, with floral tones and is one of the best choices for iced coffee. Coffee from Ethiopia is a delight that shouldn't be missed! Ethiopia is the birthplace of coffee. The regal coffees from this country are deserving of such a heritage and stand up to the calling. Referring to Ethiopia as a country of single origin, however, is misleading. Coffees from the different growing regions vary so incredibly that they do not even seem to be from the same planet! Ethiopian Yergacheffes are amazing and unique coffees. Yergacheffe is a town in the Sidamo region of Ethiopia, and the coffees from this region will surprise you with their floral and tangerine notes. In a stellar Yergacheffe, even the grounds have an exotic tropical toasted coconut aroma that will knock you over with its charms. Sometimes Coffee Joe's will try to compare Yergacheffes to other coffees, such as a bright Central American or an exciting Kenyan, just south of the border from Ethiopia, but there truly is not a real comparison. I guess you can compare a new Beaujolais bursting with wild fruit to a regal old Cabernet that has been thinking about being a wine for a decade and call them both reds, but . . . well you get my point. 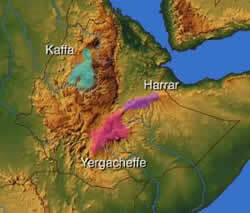 Another amazing growing region within Ethiopia is the Harrar region. Harrars are wild coffees. What's a wild coffee, you ask? The term is a fancy name for dry process or natural coffee where the coffee fruit dries on the bean, imparting the flavors of compote fruit and dark rich chocolate. Harrars are this and more! You will taste blueberry jam, cocoa, and maybe even a touch of cinnamon and cardamom in these amazing coffees. One taste of an excellent Ethiopian coffee and you will understand this passion for the bean. ETHIOPIAN COFFEE - BACK TO TOP! 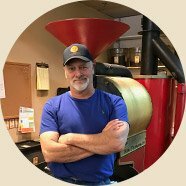 Go To Specialty-Coffee-Advisor HOME PAGE!